If you're looking for my giveaway post, please click here! OK... I'm gonna go ahead and admit something that I think makes me weird in the teaching world: I don't really do anything special to celebrate the holidays with my students. I mean, I guess I acknowledge the big ones. I read some suspenseful stories with my students for Halloween, and A Christmas Carol is always on my novel study list. But all these cutesy projects I see on my Bloglovin' feed and your TPT stores? Yeah... not so much in the middle school. So, I've been feeling a little guilty, like maybe I should be doing more to acknowledge the holidays. 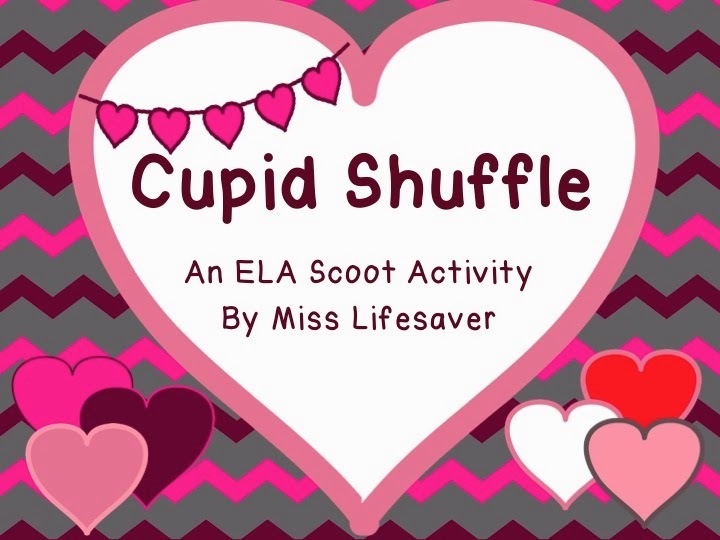 Of course, though, I want to do this without getting too off-task, and that's when I had the idea for my newest TPT Product: Cupid Shuffle Close Reading and Scoot Activity! Nothing says Valentine's Day like a good love story, right?! I typically use this story, "The Hat I Stole for Love," by Ed Stivender, during my narrative unit, but it fits perfectly here as well. It's a great text for close-reading, appropriate for grades 4-8, about Ed's first crush in 5th grade. In the story, Ed talks about his parochial education, which certainly will need some explaining for our public school students, but certainly, they can all relate to the feelings of a first crush. After reading and discussing the story together (whole or small group would work well here), I would lay out the 28 task cards for a scoot game. For those that don't know, a scoot game is played like musical chairs. Each desk gets one task card (in this instance, containing a question about this story), and every student gets an answer sheet (included). When the music plays, students "scoot" to an open desk. When it stops, they will read the task card and record their answers. Of course, because I call this the "Cupid Shuffle" scoot, that song would be my favorite choice, but really, you could choose from a plethora of love songs. An answer key is provided for review upon completion. This product is included in the 15+ product prize pack for my current Scavenger Hunt Giveaway if you'd like to snag it for FREE! In addition, there is a raffle for a 20+ product prize pack, $30 in gift cards, AND a package of goodies from New Zealand. Check out this post for more details about how you can get all these free products!!! After this weekend, this product will be available in my TPT store! Is it bad that being in middle school makes me actually hate certain holidays now? We are told not to acknowledge them...keep the day just like any other with bell to bell instruction. But suddenly kids who don't have money to buy a pencil are buying each other roses, teddy bears and chocolate, the front office will look like Walgreens threw up in it. And the drama...fights, tears...shudder I am not looking forward to it this year.